We now welcome you to your next dream oasis! The Pleasure Island is renowned and respected for it’s beautiful free form design and attached spa. 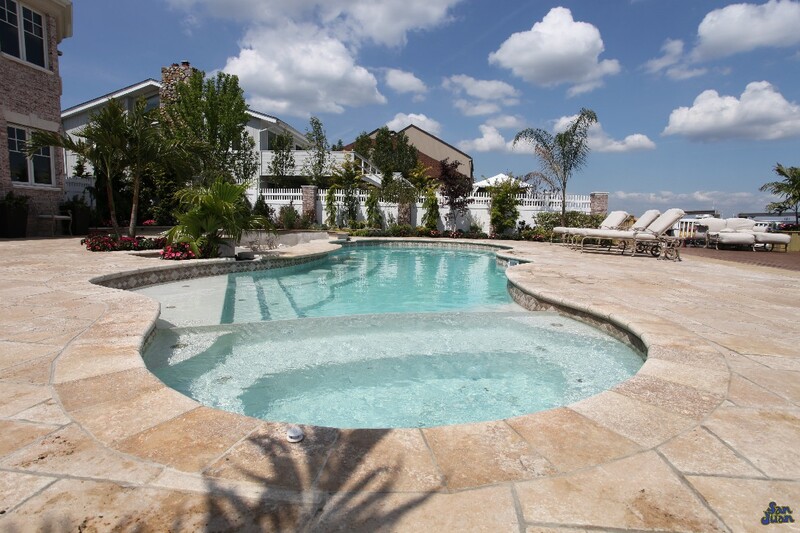 This swimming pool is perfect for developing an awe-striking scene in your own backyard! Elegance doesn’t even begin to describe the breathtaking beauty of The Pleasure Island. 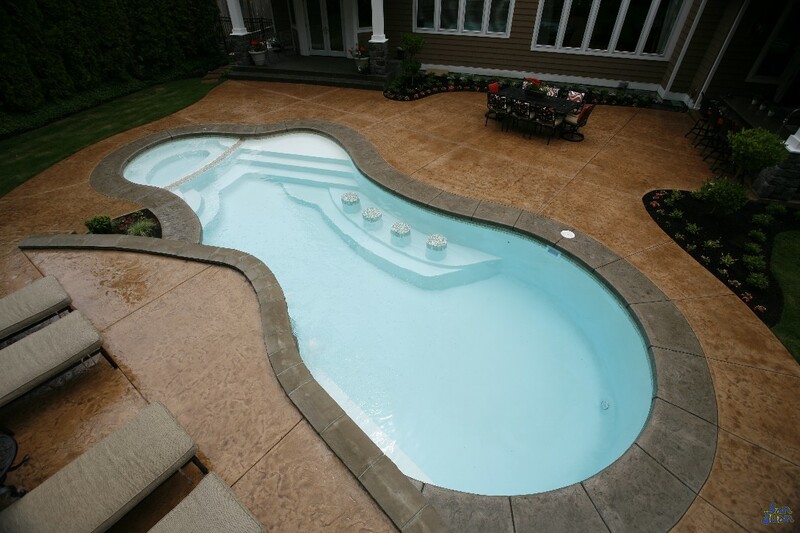 Large and beautiful are two ways to summarize this graceful fiberglass swimming pool. San Juan Pools has combined the sweeping radius’ in its free form layout with integrated bar seating, this pool is perfect for long hours of entertaining and late night cocktails with friends! We often hear from customers who purchase this swimming pool about the stunning ways that they dress it up. The above image is a perfect example of some functional design options that The Pleasure Island presents our customers! Pairing this swimming pool with some LED lighting technology, smart automated controllers and attached San Juan Spa will provide a perfect oasis you can’t duplicate elsewhere. The Bar Seating is a unique feature that our customers greatly appreciate with The Pleasure Island. This seating arrangement gives you an opportunity to be creative. 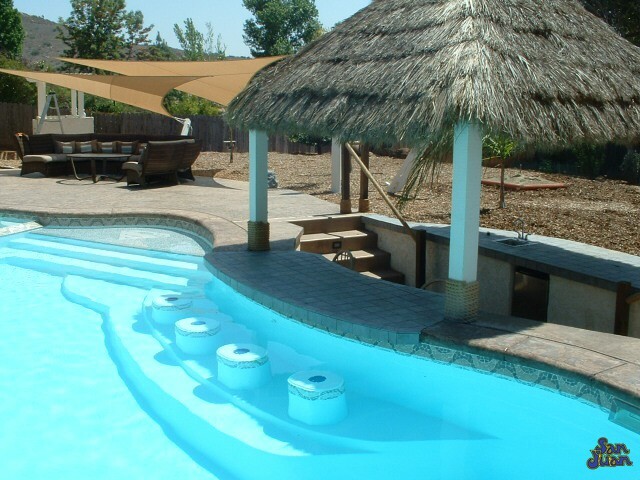 Lot’s of homeowners design tiki huts, swim up bars, or covered pergolas for added allure to their seating arrangements. Regardless of your designs, you’ve got lots of options to make this pool you unique oasis! In addition, you’ll enjoy some relaxing hours on the tanning ledge located in the shallow end of the Pleasure Island. 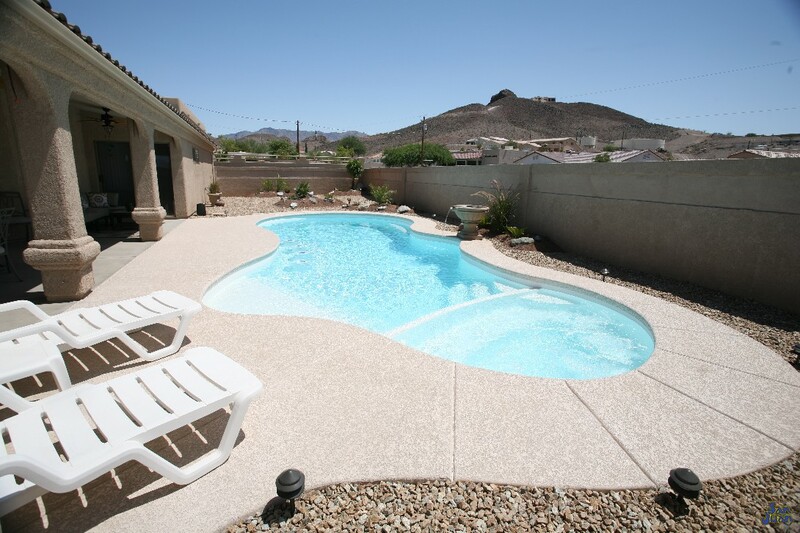 This is the perfect location for a piece of pool furniture or just to bask in the sun with some friends. It’s overall length of 39′ 11″ is perfect for providing your guest with ample space to swim and relax. Multiple swimmers are able to float on rafts while others join in casual conversation at your 4-seat bar seating. For those with tired or soar muscles, just ramp up the pool heater to enjoy some relaxing hours in the attached spa. The Pleasure Island is a very large swimming pool that holds 14,000 gallons and requires a total surface area of 448 SQFT. It therefore requires a large space for all of the fun memories that you’ll be creating! 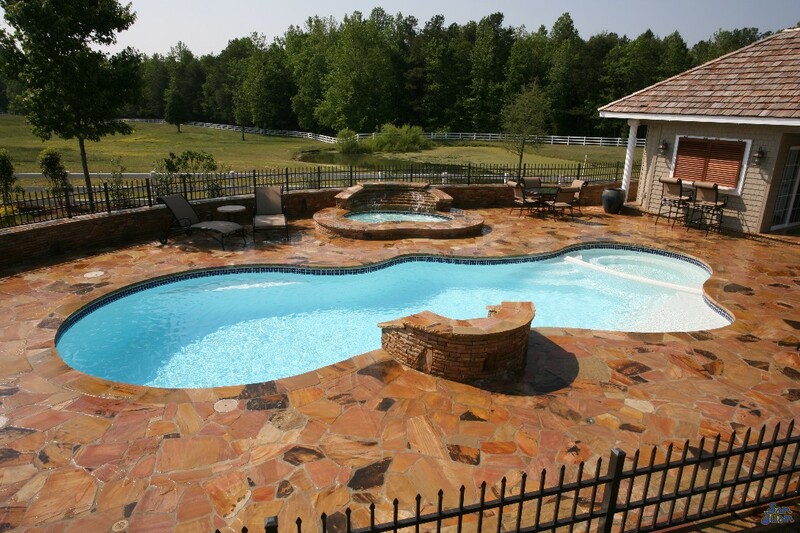 This swimming pool literally has all of the characteristics you’ve been looking for and much more! Contact us today to get started!